I LOVE fashion. I love pouring over the latest InStyle, but can rarely afford to get the lovely things I see in them. When I feel the need to spice up an outfit that I have had for a while, I find that adding some fun accessories helps to make an outfit feel a little more fresh. I love it when I find inexpensive, trendy accessories to spice up an outfit. My friends and family know this about me so I have a lot of fun jewelry. As a result, I have a large assortment of accessories in my closet, often with no home. 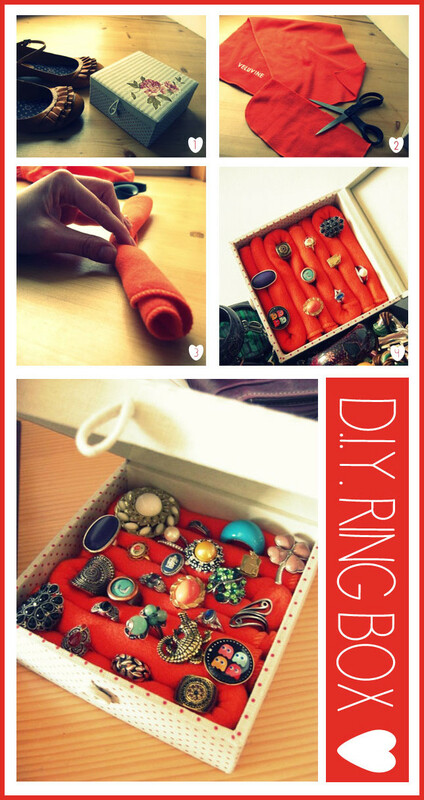 I came across this easy tutorial for a ring box at Chic Factor to make it easy to see all my fun rings…of which I have quite a few.